Knives > Hunting > What is the Best Deer Boning Knife? The 6″ flexi blade will make quick work of any boning tasks that you put in front of it. This makes it perfect for separating meat, poultry, or fish from the bone with absolute precise control. Seriously, you will really be surprised at how easy this blade will handle these tasks and the difference it makes using a high-quality blade like this over a cheaper one. The Ice-tempered high-carbon stainless steel allows it to get and maintain a super sharp edge. This blade really doesn’t need sharpening that often, however, obviously the more you do sharpen it the easier it will be to do your job. The steel is also super strong so it is not going to snap or break mid job. The bolster less edge allows you to use the whole blade when boning and also allows the blade to be really easily sharpened. For a boning knife, you are going to need a high-quality ergonomic handle that is going to allow for precision and control, which is exactly what the Victorinox 47513 provides you with. The handle is the patented Fibrox handle which is textured allowing you to get a really nice grip. Furthermore, the knife is slip resistance, meaning that even if you are covered in blood you are still able to get a tight grip on the knife which is a huge plus. The handle is also really balanced I found which allows you even greater control and precision and ensures that you are able to perform a near perfect de-boning. However, Victorinox recommends that you hand wash this knife as dishwashers and the likes can not only damage the handle and limit its effectiveness but also damage the blade and its quality and sharpness. 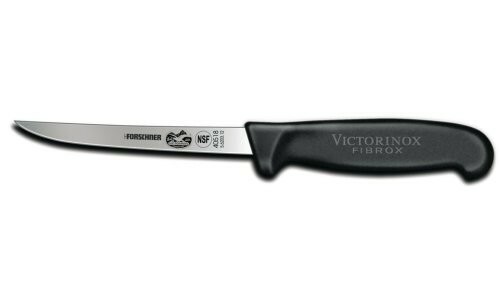 Overall the Victorinox 47513 6-inch flex boning knife is my go to boning knife and I recommend that everyone out there gets one. This knife is going to serve you well as well as being a reliable knife which you know will always be sharp and allow you to perform your job with ease. They are relatively cheap coming in at around $20 on Amazon and make a great gift.